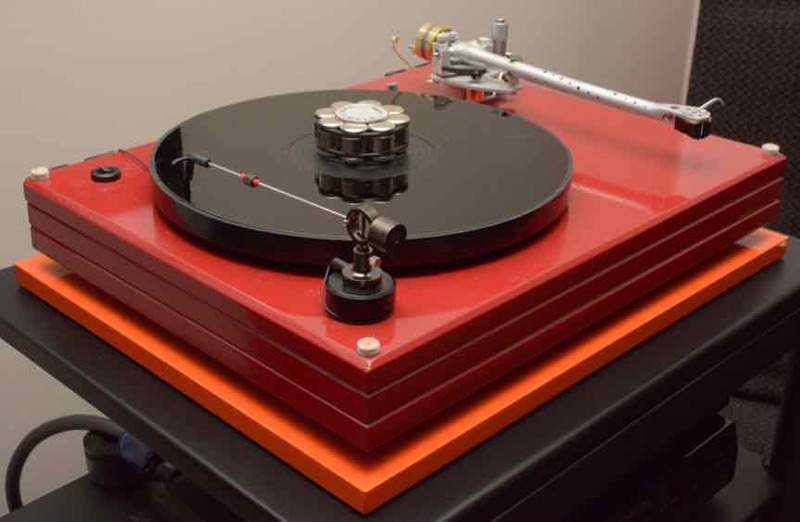 The most significant upgrade I have ever made to this turntable, with the exception of the Audiomods tone-arm, is the SRM/TECH Deluxe Acrylic Platter . However, I hasten to add that without all the other upgrades, the full benefits of this platter would be lost in a muddy quagmire. But this was definitely an upgrade that assisted in elevating this turntable from very good to stunning, with the presentation of superb details and spacial clarity never before heard. The platter is made from jet black acrylic and features a two-part construction to reduce resonance, together with a Platter Damping Ring which acts as a peripheral wave trap. It's a basic design, unlike many others that have the opaque white "very engineered" look, but it is 20mm thick, which provides about 50% more mass than the 10-12mm platters. The recess diameter of this platter measures 163mm, which is slightly larger than most other thick platters. If, for some reason the motor is not precisely aligned, the pulley may bind on the platter. The extra diameter this platter offers should provide enough clearance to prevent this. It comes with a package of small rubber mounts of different thickness, with which you can adjust the VTA, without having to add/remove spacers, but I found these degraded the performance on my ISOKINETIK Sub Platter, so I now use three brass discs in their place, which made a considerable difference in the details retrieved and the smoothness of the overall sound. The one caveat I would bring to your attention is that if your Rega uses one of the standard plastic sub-platters, this may not allow this platter to perform up to its fullest potential, but then, I would also urge anyone contemplating the purchase of this platter to also look into the Isokinetik sub-platter (or similar products). The clarity and depth this platter brings to the musical image is nothing short of amazing. Every nuance came to life in a manner I have never before experienced, From the very dynamic crack of the snare drum (like a rifle shot) to the subtle room acoustics that are now so clearly audible that I'm drawn right into the performance. Your Rega turntable deserves this Platter/Sub-platter combination - A highly recommended purchase! Which Component is the Most Important? Another age old question that is still debated to this day without any real answers - I hope this will assist! Before we delve further I just want to mention Component Resolution - which refers to the amount of detail a component is able to provide or allow. passive components - like an interconnect simply allows whatever resolution is present to pass through them - or not. Extremely well built components will allow you hear minute details, such as the sounds of an instrumentalist breathing while they play, or the concert hall reverberations that makes it sound as though you are right there at the time of the recording. Every component has a limit to the details it is able to resolve due to its construction. One consideration when building an audio system is to match those limits across all components - otherwise the component with the highest resolution ability is being under-utilized. Good quality cables become more important as the output voltage of a component reduces e.g. Due to it's incredibly small output voltage it requires a cable of the lowest possible impedance in order to transfer the entire signal. This same argument could be made for every component in the audio chain, but once the signal becomes amplified, the higher voltages in play are able to overcome the internal resistance of a lessor quality cable, allowing the next component in the audio pipeline to still receive those fine details for subsequent processing. Extending this to an outrageous conclusion might imply that you could use a rusty nail to connect the amp to speaker? Over the past few months a friend has been required to use his "consumer grade" receiver in place of his pair of tube amps that are out of service for a component retro-fit. He has an extremely good turntable with a custom built phono stage, a very good CD Player and very detailed speakers, but the one thing that surprised me is just how good the consumer receiver actually performs - specifically, very good spacial definition in width and depth and a pretty dynamic response, which surprised me and him a lot. So from this, is the answer to the question - always spend the most money on source components? It would certainly seem that way to some extent from my friends experience. e.g. My NAIM integrated amplifier is priced far from the exotic brands, but turns in a very respectable performance when connected to higher quality source components. What else could be considered "Important Components"? These are the work horses of the system and providing they are chosen wisely - they should provide an excellent listening experience for a long time - so choose wisely and for the long term. So, speaker choice may dictate amplifier choice (and amplifier price)? - YES! Every component deserves an interconnect of a quality that reflects the abilities of the component! So, if you have a high quality component, you should have an interconnect that is capable of transferring the entire signal made available by that component. This applies to analogue and digital forms of signal transfer also. Some people declare that they have tried better quality interconnects and heard no difference! Power cables make a significant improvement in the performance of a hi-fi component - please refer to Why Good Power Cords Make A Difference for an in depth look at their importance in a system. Hey - what about turntables? - the most complicated of sources. If I could go back in time and knowing what I know now - I would opt for the better quality turntable and save myself all the upgrade hassle. Find the best Source components I could afford! So as you can see in this discussion - I lean towards the purchase of better source components - even though I posses more modestly priced sources. But MY sources have undergone significant DIY upgrades over time to augment their performance level. Other people may not feel "equipped" to perform such enhancements, but whichever route, good source components are definitely worth the investment . Today, there are some great pre/amps at reasonable prices that are capable of performing close to the levels of higher priced source components when connected via good interconnects and good power cables. Opting for a more affordable pre/amp may be a better budgetary choice without sacrificing too much on the performance front. Good source components tend to make a more appreciable impact when coupled with the right power cords, interconnect cables and power supply components. Matching the source components with their interconnects, the amp with the speakers and all components with power supply components can be time consuming and expensive, but the internet is a wealth of information that is at your disposal, so make use of it. Bottom Line: it's up to you to determine what components you require. Do your homework, otherwise you will find yourself owning some very questionable purchases.